Made from the finest 100% oilcloth, lined with jersey mesh, and solid brass hardware. Accented with suede calf skin leather on the collar, cuffs, and cuff strap, elbow patches, and license tag. Features include; double sided bird bag, D ring and swivel snap on the side for hooking your duck line or lead rope, expandable pockets that will hold 2 boxes of 12 gauge shotgun shells, inside pocket for e-collar, keys, wallet, inside 1/2 sleeve (storm cuff) which will keep your arms dry when reaching down in the wet grass. The Guide Jacket is the ultimate in field equipment, giving you protection from the elements while functioning to carry all the things needed in the field. Made from the finest 100% oilcloth, lined with jersey mesh, and solid brass hardware. Accented with suede calf skin leather on the collar, cuff and cuff strap, license tag, elbow patches and shooting patch. 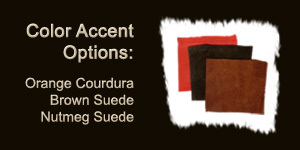 Your choice of nutmeg suede, brown suede, or safety orange cordura. Features include; double sided bird bag, D ring and swivel snap on the side for hooking your duck line or lead rope, expandable pockets that will hold 2 boxes of 12 gauge shotgun shells, inside pocket for E-collar, keys, wallet, inside 1/2 sleeve (storm cuff) which will keep your arms dry when reaching down in the wet grass, The Hunter Jacket features a shooting shoulder pad, your choice left shoulder or right shoulder. Further customize the jacket with your name on the upper pocket flap. 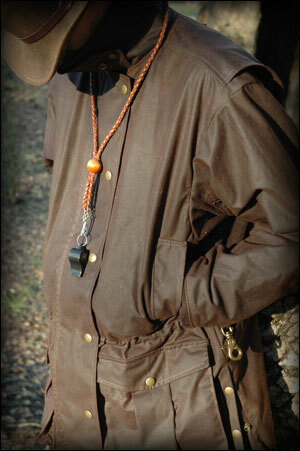 The Hunter Jacket is the ultimate in field equipment, giving you protection and functionality. The newest addition to our line. 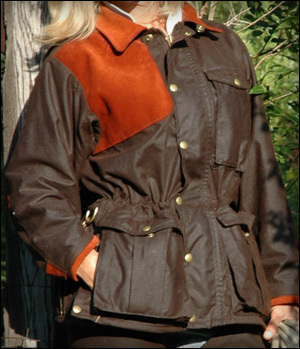 The Field Trial Jacket has features for those who hunt off horse back or trail ride. Made from the finest 100% oilcloth, lined with jersey mesh, and solid brass hardware. Accented with, suede calf skin leather on the collar, cuffs, cuff strap, elbow patches, and license tag. 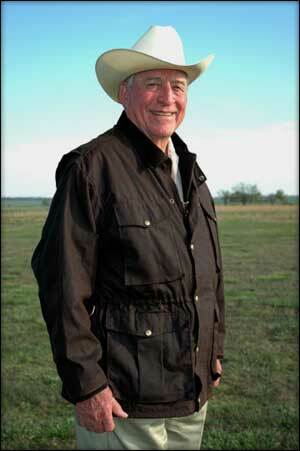 Features include; front hand warmer pockets which are accessible when sitting, D ring and swivel snap on the side for hooking your transmitter or lead rope, expandable pockets that will hold 2 boxes of 12 gauge shotgun shells, inside pocket for e-collar, keys or wallet, collar snap flap to secure the collar up for added water and wind protection, inside 1/2 sleeve (storm cuff) which will keep your arms dry when reaching down in the wet grass. There is no bird bag in this jacket to confuse a field trial judge. The Field Trial Jacket is the ultimate in field equipment, giving you protection from the elements while functioning to carry all the things needed while riding in the field. 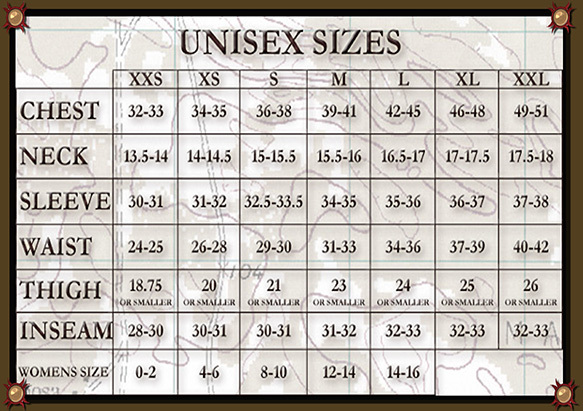 When looking at the size chart, use your true measurements. Do not calculate for any additional clothing, we have already calculated that for you. 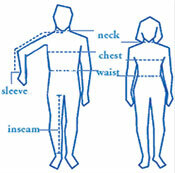 If you have any questions about sizing, please contact us at the studio.